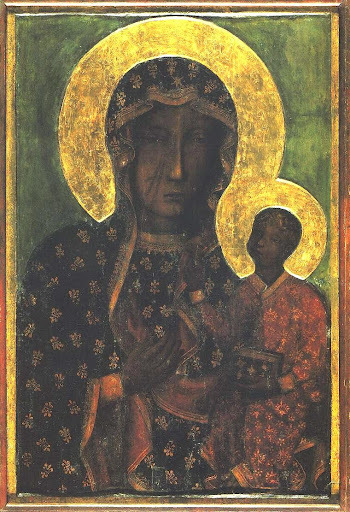 The origin of this English-language Novena prayer to Our Lady of Jasna Gora (aka the Black Madonna of Niepokolanaw, Czestochowa, Warsaw) is unknown. Our Lady of Jasna Gora, Mother of the Church, with choirs of Angels and our Patron Saints we humbly kneel before Your throne. You have for centuries been shining with miracles and graces in Jasna Gora, the capital of your mercy. Look into our hearts, which pay homage and respect to You, showing great devotion. Awaken the hearts of saints among us, make us real apostles of faith, strengthen our love to the Holy Church, and implore thy powerful intercession in obtaining all graces. Our Mother with a scarred face, embrace me and all people that are dear to me. I trust in You and hope for intercession with Your Son, praising God, the Holy Trinity.